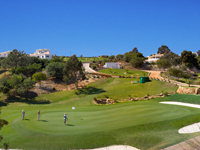 Golf St Antonio , ex Parque da Floresta , is situated near the fishing village of Salema, near Sagres - one of the most important places in Portuguese and European history - and close to the Costa Vicentina nature reserve. A hilly course, with sharply sloping fairways, several blind shots, and greens on hill tops, creating a strange but very pleasant effect, perfectly integrated into the landscape. As for playing the course, we feel that it becomes too tired sometimes unappealing to golfers who are not so young.